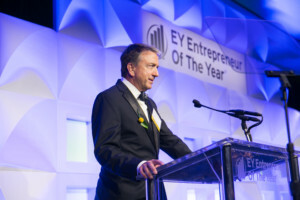 Washington, D.C., June 20, 2017 – EY has announced that Andy Macdonald, Chief Executive Officer of Consilio, a global leader in legal consulting and services, received the Entrepreneur Of The Year® 2017 Award in the Consulting category in the Mid-Atlantic region. The award recognizes entrepreneurs who are excelling in areas such as innovation, financial performance and leadership, both within their businesses as well as their communities. Andy was selected by an independent panel of judges, and the award was presented at a special gala event at the Ritz-Carlton, Tysons Corner in McLean, Virginia on June 15, 2017. Andy Macdonald and Consilio were recognized amongst peers whose ingenuity, spirit of innovation and discipline have driven their companies’ success, transformed their industries and made a positive impact on their communities. Consilio’s consulting and services teams assist legal departments of multinational corporations and their outside counsel to respond to legal matters, reduce legal spend, minimize risks and operate more efficiently. As a Mid-Atlantic region award winner, Andy is now a candidate for the Entrepreneur Of The Year 2017 national program. Award winners will be announced at the Entrepreneur Of The Year National Awards gala in Palm Springs, California, on November 18, 2017. The awards are the culminating event of the Strategic Growth ForumTM, the nation’s most prestigious gathering of high-growth, market-leading companies.